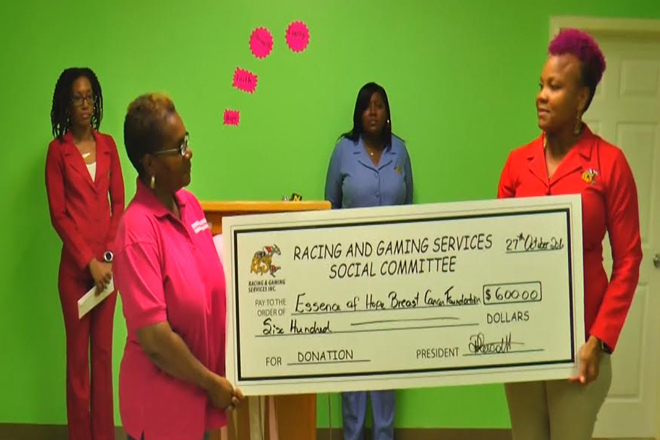 (ZIZ News) — In commemoration of Breast Cancer Awareness month, the Racing and Gaming Services Social Committee donated an EC $600 cheque to the Essence of Hope Breast Cancer Foundation during a handing over ceremony held at Racing and Gaming Services on Thursday. President of the Racing and Gaming Services Social Committee, Delisia Lescott made the presentation on behalf of the organization and pledged their continued support to Essence of Hope. “As we all know, the month of October is celebrated worldwide as Breast Cancer Awareness month. The support from all our team members was tremendous as we undertook a week of activities marking Breast Cancer Awareness month. The idea was successful and we hope it can become a yearly event to assist the foundation”, Lescott stated. President of the Essence of Hope Breast Cancer Foundation, Pam Hendrickson accepted the donation and thanked the Racing and Gaming Services Social Committee for their support. “On behalf of Essence of Hope Brest Cancer foundation and its members, I want to say thank you to the Racing and Gaming Services for such a wonderful gesture you have done for us. We do appreciate this because we have so many women who are in need of this right now. We have a lot of women who have been diagnosed with breast cancer and need your help for chemotherapy treatment. So we want to say thank you to all the wonderful workers and staff for doing this for us”, Hendrickson expressed as she received the donation. The funds raised were a combined total from Racing and Gaming’s Week of Activities hosted to mark Breast Cancer Awareness month. The week of activities included a Mufti Day where employees paid to dress out of uniform, a walk-a-thon sponsor sheet as well as a candy station where food items and snacks were sold to consumers. The Racing and Gaming Services and Social Committee is a non-profit organization established since December of 2006. The week of activities ran from October 11 to October 18.